the ESP32-Wrover-Kit is a nice ESP32-based development board (actual version is V.4.1 at time of writing (April 2019)) released by Espressif Systems and available from distributors such as Mouser, Olimex and others for about 35,-- EUR + VAT. It includes a 3.2” TFT display with a resolution of 320x240, a sd-card-slot, a RGB LED, camera interface and a lot more stuff. 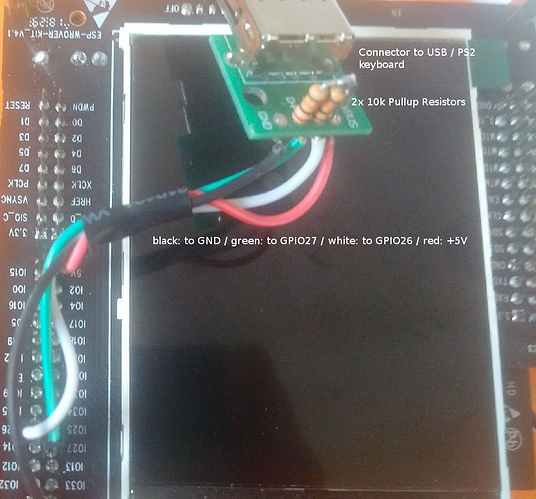 It is an ideal platform for running uLisp, You’ll find more informations about that board at the espressif doc site. I built another uLisp-Machine with the ESP32-Wrover-Kit (V.4.1) and a PS/2 PC keyboard (most USB keyboards should work because most of them have a PS/2 compatibility mode (but not all USB keyboards have this mode)) To connect the keyboard only four wires and two resistors are needed. My version of uLisp supports the TFT (including parenthesis highlighting, input indenting and (simple) graphics) and an (english) PS/2 PC keyboard. 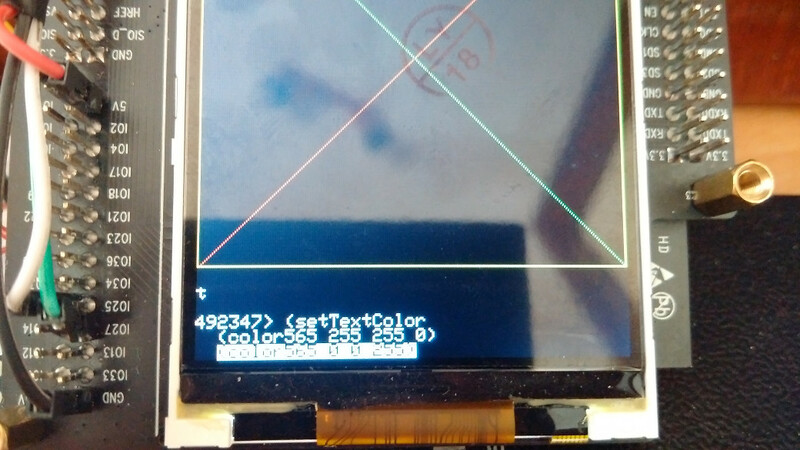 There’s also support for the sd-card interface, i2c bus and spi (untested except the tft and sd-card) and the 4 MB PSRAM. I also add a few functions to uLisp such as (setTextColor), (plot), (readPixel), (scroll), (ls), (rm), (rmdir), (mkdir) and esp32-sleep functions (see README.md from my uLisp github page). You can find this uLisp version at my github page (https://github.com/kaef). I updated the uLisp version to uLisp-2.6! All additional functions are still available (light- and deepsleep, Wrover-Kit-TFT, PS/2 keyboard etc.). I also add some more documentation (references for the added functions, ESP-Wrover-KIT setup instructions).